In 1905 Santa Rosa, gamblers held sway whenever the horses were running at the track. The scene downtown was compared to a "mining camp" as saloons and hotels turned into casinos while cops and local officials looked the other way, or even joined the illegal gaming. Aiding and abetting the scene was the Press Democrat and its editor Ernest L. Finley, who had kept quiet about the problems for more than a decade, then sought to discredit the rival newspaper for exposing Santa Rosa's dirty laundry. Worse, Finley further attacked an association of residents seeking to clean up the town. The "Good Government League" didn't make its membership public at first, which Finley used as an excuse to compare it to a pair of loathed secret society hate groups, most prominently the Citizen's Alliance, which was much in the news in 1905. An extreme example of an "astroturf" group created by powerful interests posing as a grassroots organization, the Alliance started as a 1903 effort by Colorado mine owners to violently crush the union movement with muscle from the state National Guard. An attempt to start a branch of the Alliance in San Francisco was made, but backlash was so fierce in the pro-labor city that corrupt Mayor Schmitz won reelection by (wrongly) accusing his opponent's party of being in bed with the Alliance. Finley also invoked the A. P. A. (American Protective Association), a late 19th century anti-Irish, anti-Catholic, anti-immigrant hate group that sought restrictions on immigration, even though the A. P. A. was only a historical footnote by that time. But after the Occidental weekly paper penned an editorial encouraging the Good Government League for taking on "the criminal element and their jack sympathizers...a direct and legitimate outgrowth of a sad state of affairs," Finley had new, wet mud to fling. While the Republican reprinted the entire laudatory editorial from the West Sonoma Mountaineer, the Press Democrat lifted only a section that inaccurately remarked that the group was based "somewhat upon the order of the vigilantes of the early 50s in San Francisco." Now, the PD editorial page sneered sarcastically that the Good Government League was no better than a lynch mob: "Unwind the long-coiled noose, and have it ready! ... The fool Republican -- and its brave Vigilantes forever!" Finley had painted himself into a corner by attempting to demonize the Good Government League as a sinister force that irresponsibly didn't care if their efforts damaged Santa Rosa's "good name abroad." Once the group's leadership was announced, however, it was revealed the town's biggest boosters were in charge: President of the League was Professor Sweet of the Santa Rosa Business College, and VP was none other than the idolized Luther Burbank. Neither the Press Democrat or the Santa Rosa Republican mentioned the League again, and it's doubtful that it had much, if any, effect on reducing crime and vice. A race meet the following month drew five hundred men from San Francisco, and they probably didn't travel here to check out our "improved hotel accommodations," as the PD absurdly suggested in one editorial. The 1908 maps also show Santa Rosa still had a large red-light district downtown with nine bordellos (down from eleven in 1904), so there was scant sign of progress there, either. But even if reform efforts failed, this was still a watershed between the 19th and 20th centuries for the town. The Wild West days were near their end; Santa Rosa was looking more like a typical Midwestern or East Coast community of clerks and merchants and electrical machine operators. Just the year before, voters joined the rest of the nation in giving Teddy Roosevelt a landslide victory, marking Santa Rosa's first break with its Old South political allegiances since the Civil War. Much credit due for dragging this town into the modern age goes to the new team over at the Santa Rosa Republican, who had taken the helm only about nine months earlier. Their "wide-open town" report was the kind of cutting-edge muckraking journalism much in favor in the cities, but never seen before in Santa Rosa. They clearly worked hard to make a go of it, and surely in 1906, their circulation would've soared past the Press Democrat; they were now the official paper for Sonoma County (which meant lucrative legal notices), and more local news was breaking first in the Republican, leaving the PD to play catch-up the next morning. But less than two months after their final League story, the Great Earthquake struck and editor William B. Reynolds and manager W. H. James left for reasons unexplained. Santa Rosa was the worse for their departure. Analysis of the Good Government League angle of the story also may reveal much about the Press Democrat and its editor. Was Ernest Finley truly unaware that the town's most respected citizens were leading the group? If so, it suggests that he and his circle were shockingly out of touch, and the Press Democrat represented only the fading voice of Santa Rosa's entrenched Old Guard. With a great show of mystery and black type it is announced by the Evening Republican that a so-called "Good Government League" has been organized here "for the purpose of enforcing law and order." From reading the announcement, one would think that Santa Rosa is a veritable hellhole instead of one of the quietest and best regulated residence towns in the State, and unfortunately the former impression is the one that the screaming announcement will create everywhere outside. Judging from the announcement referred to, the alleged organization proposes to do its work in the dark. Every possible effort seems to have been made to keep the preliminary arrangements quiet, and even now its officers and members refuse to allow their names to be known, while they even say that the methods to be pursued "are not to become public." The Press Democrat takes no stock in any organization that is afraid to come out into the open, and very little stock in any man who, when it comes to a matter of effecting the public welfare, is afraid to show the courage of his convictions. Such methods smack too much of the notorious A. P. A. and the much-discussed Citizen's Alliance to ever have our endorsement. The Press Democrat denies the right of any handful of men to assume to themselves all the virtue and all the morality in any community, and to swell up and say that they propose to scrutinize and select with great caution the members of any non-sectarian and non-partisan organization proposed for the betterment of the public weal. This is a matter in which all good citizens are interest, and one in which every man, woman and child who desires should be allowed to participate. We think we know something of the motives back of the men who are really responsible for the mysterious organization said to have just been started for the "enforcement of law and order"; but let that pass. We know beyond question that if conditions here really justify any such organization, every decent man who has the welfare of the community at heart wants to get in behind it and help make the organization a success. The writer certainly does, and is not ashamed or afraid to let it be known, either. Instead of proceeding by dark lantern methods, the so-called "Good Government League," if it ever hopes to enjoy anything but the well-merited contempt of the community at large must throw down the bars, step out into the open, and fight a fair, manly and American fight. If the men back of the new organization are sincere in their intentions they should drop their present methods and call a public mass meeting, with all seats free and unalloted and with the sign out in big letters, "Come and Help us Reform this Sickening Stinkpot of a Town!" because boiled down and stripped of its verbiage, this is the idea and description of our beautiful city that they have really sent out broadcast over the State. The formation of a secret political organization here to be known as the "Good Government League of Santa Rosa and Vicinity" has been announced. The officers and members of the League refuse to disclose or admit their identity, and while a platform has been published declaring the object of the League to be the "securing and enforcing of law and order," the statement accompanying it says that even its methods of procedure are not to be made public "unless the welfare of the community demands it." It was reported upon the streets last night that Dr. C. W. Savage, the dentist, is President of the new new organization. When interviewed by a Press Democrat representative regarding the objects and aims of the League, the reasons back of its formation, etc., Dr. Savage refused to either affirm or deny the report that he headed the organization, but practically admitted that he is a member. J. H. Fowler, the well known capitalist, is another gentleman whose name has been mentioned upon apparently good authority as being actively identified with the formation of the new League. Nobody appears to know why an organization formed with any such object as that mentioned in the League's platform should be secret in its nature. It is claimed that the new organization will be non-sectarian and non-partisan. The morning paper, in a very lengthy editorial today proceeds to berate the business and professional men of Santa Rosa for daring to organize secretly and map out a campaign to fight certain civic evils that have become so flagrant that decent people can no longer tolerate them. The "writer" in the Press Democrat has made the mistake that his prejudices against the Republican would naturally lead him into--that of assuming that the publishers of this paper were at the bottom of the movement to organize the Good Government League. As a matter of fact the publishers of the Republican are not members of the Good Government League and had nothing whatever to do with its organization. An effort is made also by the morning paper to create the impression that the organization is a sort of dark lantern Prohibition affair. The Republican is advised by members of the organization that among the members there is not a single one of the ministers of Santa Rosa. Further, it is stated by the same men that Dr. Savage is not the president of the organization and that it is composed of nearly two hundred men who have joined irrespective of party affiliation, irrespective of religion, and that the league is not formed to put any particular man out of office. As to the saloons of the city, it is said that the league is not organized to put them out of business. It is admitted, however, that the platform printed in last night's Republican, represents the exact attitude of the members in regard to the activity of the league in the community and that its work will be along the lines suggested. Asked in regard to the reason for maintaining secrecy, a member of the organization stated this morning that there was every reason for such a course. It was not the purpose of those who had thus banded themselves together for the common good to have an organization which could be disrupted by the introduction of men who evidently belong to the element for which the morning paper finds it necessary to act as an apologist. The Republican was assured that no amount of raging on the part of the organ of the gamblers would cause the league to make public the personnel of the organization or give out information that would aid the evils to be attacked to secure comfort and relief by invoking an open fight until the league is good and ready to have a fight that will win for the people. In railing at the men who compose the Good Government League of Santa Rosa, the Press Democrat, the friend of the law-breakers in Sonoma County, has declared that the secret methods adopted by the league "smack too much of the A. P. A. and the Citizens' Alliance" ever to have their endorsement. But the morning paper has neglected to include the Gamblers' Protective Association in the category of secret organizations which it so vigorously condemns. Perhaps the fact that the Gamblers' Protective Association is being helped in its boycott on the Republican by the Press Democrat puts that aggregation of worthies in an altogether different class. It is to be assumed that the Press Democrat is a good Democratic journal...it ought to be a good advertisement for this community, therefore, instead of a distraction, to have it understood elsewhere that the people have organized to fight for better municipal life. However, nobody with any real conception of the situation would expect the "writer" in the Press Democrat, the acknowledged organ of the gamblers, to take any other course than one which would try to throw dust in the eyes of the people, and claim that publicity about the civic rottenness hurt the town. Yes, it may hurt somebody who gets hit but not the town. The Press Democrat professes ignorance of local conditions which make it necessary that a secret organization of the community's leading business and professional men should be formed to change the trend of affairs. With a great show of indignation that the journal "denies the right of any handful of men to assume to themselves all the virtue and all the morality in the community." Possibly it has not occurred to the "writer" in the esteemed morning journal that there are men in the newly formed league who are somewhat older in years than he is and should be supposed to know what they want and do not want in the community." It is to be taken for granted, too, that the ideas of civic morality entertained by a confessed friend of the gamblers will scarcely have any great weight with men who have minds of their own, families of their own, and property and business interests to protect. It is quite evident that the organization of the Good Government League is causing the publishers of the morning paper a great deal of uneasiness, else they would not make the mistake of "roasting" the men who think they have a right to meet secretly if they like and talk over plans for changing certain conditions in the community which at present meet with their disapproval. If the morning paper did not feel that the new organization was going to interfere with its friends why should it set up such a howl in a vain effort to fool the public and attempt to hide the real issue-that of a fight for better civic affairs? As a matter of fact the morning paper has not only lost friends but made enemies by its silly conduct of berating leading citizens who know their own business. And it will not help the cause of the morning paper, either, to charge the Republican with having been responsible for organizing the League, for deliberate distortions of the facts in such a case as this only tend to make the men interested in the movement all the more insistent in carrying out their plans. The Republican isn't worrying about what the League will do, and it is poor business for the morning paper to exhibit such remarkable alarm at this time. Is it possible that, as the old saying runs "a guilty conscience is the best accuser," and that the morning paper really has had a hand in matters that it fears the League in its investigations may uncover? Editor Press Democrat: In a leading article of Wednesday you class the Citizen's Alliance with the late A. P. A. and the Republican Good Government League as a secret society. In this you are unfair. The stationery of the State and the San Francisco Alliances exhibits names of officers. The officials of the Santa Rosa Alliance are no secret. Yours faithfully, Will Tod, Secretary. It is true that the names of the principal officers of the Citizen's Alliance are not kept secret, in which respect that organization is ahead of both the late lamented A. P. A. and the Republican's alleged new "Good Government League." At the same time, it works in the dark and the names of its members are never revealed. To all intents and purposes, the Citizen's Alliance is just as much of a secret organization as the American Protective Association ever was. And it is a great deal more of a secret organization than is the alleged "League"--or, than it will ever be, for that matter. A sensible and right-thinking public has already placed the latter organization where it properly belongs--on the shelf along with the rest of the Evening Republican's withered hopes. The natural result of the Evening Republican's rattle-pated policy is now beginning to make itself felt. Taking the absurd statements made by the afternoon paper seriously, newspapers outside have begun to comment upon the alleged conditions here; these reports may naturally be expected to spread and unless some way can be found to stop the thing, the better class of homeseekers will be apt to give Santa Rosa a pretty wide berth hereafter. Sending out reports like those referred to is bad enough when they are justified. But when this is not the case, as in the present instance, such work is little less than criminal. The press of the State must understand that there is no truth in the reckless reports being spread abroad by the Evening Republican regarding conditions existing here. Santa Rosa is one of the cleanest and best regulated residence cities in the entire State. Any newspaper questioning this statement is invited to send a representative here to see for himself. The "ward strikers," the "scavengers of political corruption," the "civil lepers," the "stranglers of business," the "blighters of the future of our homes," etc., that the Republican chatters so about exist only in the fertile imagination of the men now controlling that paper's feeble destinies. The only trouble is that the Republican's managers haven't brains enough to conduct even a little newspaper fight without making star-spangled [line missing, damaged microfilm] to do much of anything else, for that matter. And any newspaper feeling disposed to challenge the truth of this latter statement is also invited to send a representative here to see for himself. If the esteemed morning paper, which has reached the screaming stage in its denunciation of the purposes of the newly formed Good Government League, would only help in ridding the community of the abuses which the men in the league say exist here, there would be need no longer for the activities of such an organization. Has the morning paper the moral courage to call a spade a spade when it fears that it will lose a five-cent piece in incurring the displeasure of some of its numerous friends? Friends of law, order, and the rights of persons and property in Sonoma County have grown so desperately tired of the career of the criminal element and their jack sympathizers that a league has been formed, somewhat upon the order of the vigilantes of the early 50s in San Francisco and the "603" organization in Nevada in the early days of the Comstock. We are informed that every large town in Sonoma County is represented in this new league formed to ferret out and prosecute criminals. It is not strange that hard-working, debt-paying citizens should grow desperately tired of being everlastingly bothered, and their lives burdened by persons who not only care absolutely nothing for decency and good order, but besides are notorious for so ordering their lives as to be forever within the shadow of the jail or penitentiary...The Mountaineer is not in favor of secret or "star chamber" proceedings of any kind in aid of the cause of justice but what can be done? How otherwise may these lawbreakers be reached? The new and powerful organization now rapidly increasing in the cities and towns of Sonoma County is a direct and legitimate outgrowth of a sad state of affairs too grievously burdensome to be longer borne in silence. Editor Press Democrat: Will you please print this ? I am a citizen and also a taxpayer here, also a man of family and in business, and the way I look at it have some right to be heard on public subjects once in a while; and the evening paper had an article tonight that it seems to me will do us damage outside, and I want to say so. This article was printed from the West Mountaineer in Occidental, in this county, and it is not true. When any newspaper goes this far and prints an article from another paper, giving the article a backing at home, it certainly looks to me as if the article ought to be true or else not printed at all, unless to answer it and say it is not true; because it give strangers a wrong idea. The Mountaineer's piece says we are getting up a Vigilance committee here. This will give people a nice idea of Santa Rosa, now, will it not? Why should we start a Vigilance committee here, or even a Law and Order League, like the evening paper talks about? Would anybody want to join a League or Committee here, in one of the best home cities in the State of California today, with some of our best men in town in office and the laws enforced and everything all right? Anybody can ask himself a question like this, and I think we all know just about what his answer would be. I live here, and my business is here, and so I do not want to see Santa Rosa get a bad name elsewhere when the facts are that our city is a model for order, and much ahead of most others in this state in everything that makes a town worth living in and bringing up a family in. This is a kind of newspaper work that I surely do not approve, and I do not think very many other people will approve it either. Nobody here in Santa Rosa pays attention to the evening paper's big pieces about its Law and Order League, but it seems that they do outside. And where will Santa Rosa get off? TO THE FRONT AND CENTER! That's the stuff. And in the immortal words of the typewriter salesman, "Now is the time for every good man to come to the aid of his country." The daring deeds of lawlessness and the sickening days of bloodshed that have followed the withdrawl of those three or four advertisements from the Republican's columns have (in print) certainly been something awful. Unwind the long-coiled noose, and have it ready! See that the shrill alarum-bell, now cobwebbed and dusty, again swings clear! At the first tap shoot low; give no quarter; and let the battle-cry be "Nat Reiss, Fifteen Dollars and Silence," (or something equally alliterative and euphonious)!! The fool Republican--and its brave Vigilantes forever! To h--l with the town and its good name abroad!!! Has the Morning Screamer been so busy dodging the various bricks it thinks the Good Government League intends to heave that it has no time to keep up with the procession in the matter of the plans of the electric railroad for building a line to the bay? Every paper except the Morning Screamer in this part of the world has known and has printed stories weeks ago concerning the intentions of the electric line. However, it is better late than never. At last, at last, the esteemed morning paper gets itself on record in the matter of enforcing the law against gambling. Some months ago when the District Attorney closed up games in Santa Rosa the Democrat's eloquent silence upon the subject o f Mr. Pond's action led many people to the belief that the aforesaid Democrat tacitly stood with gamblers. Now it seems that the public was mistaken in its opinion at that time, or at least, the Democrat may have become a convert to the ideas of the Good Government League. Time works wonders, and it is pleasing to Mr. Pond's friends to read such an endorsement of his policy. The Good Government League of Santa Rosa and vicinity has been steadily growing in membership during the past few months since its organization. It has also been steadily formulating its plans and getting ready for active work. The platform of the league has already been given to the public but as it very concisely states the purpose of the organization it is herewith given that the minds of those interested may be refreshed. This organization shall be known as the Good Government League of Santa Rosa and Vicinity. Its object shall be the securing and enforcing of law and order. To this end the League shall study our social conditions and needs; shape public opinion upon questions relating to local government; endeavor to secure the nomination and election of competent and trustworthy men for office; federate the moral force of the community, and protect the common welfare and prosperity. It seeks to accomplish this object by honest and vigorous investigation of civic affairs; by awakening public sentiment concerning existing evil; by enforcement of present laws; by securing improved legislation; by suppressing graft; by upholding official honor and by stimulating the public conscience and massing the moral influence of the people for the common weal." First of all it should be said that this organization is rather constructive than destructive. There may be those who have the idea that it is organized to fight some thing. According to its platform, the great work of the league is to construct, to build up. The study of social needs and conditions is an important factor with the idea of building up in everything that relates to the betterment of the community. The League desires to have a salutary influence on municipal affairs. Just so far as it has any power it desires to assist in securing the nomination and selection of trustworthy men for office. When such men are elected it proposes to stand by them and give them such backing as will make it easier for them to perform their duties. In the past there have been times when our city has suffered because some officer or officers who wanted to do their full duty found obstacles and impediments almost without number. The league proposes to say to a good man: "Go ahead: we will back you." Such support is worth much to a man in office. While the main business of the league is constructive, it proposes so far as it has any power, to do away with abuses that may arise from time to time. The league has outlined as a basis for operation the following departments of work which has been put in charge of committees: Education, Legislation, Amusements, Public Morals, Streets and Parks, Public Utilities, Sewage and Sanitation, Criminology, Publicity, Business Promotion, Arbitration and Harmony, Law Enforcement. It may be of interest to the public to know that Prof. J. S. Sweet is the president of the league and that Luther Burbank is its vice-president, and that C. B. Wingate and A. Trembley are secretary and treasurer respectively. There is also an executive committee of nine substantial citizens. The membership is now considerably considerably in excess of two hundred and is rapidly growing. At every business meeting there is a large influx of new members who, with the others, are from the various walks of life in Santa Rosa and are earnest representative men who desire the best things for Santa Rosa, Such a body of active men will certainly have to be counted with in the coming municipal election. These men are not so much interested in the political complexion of the men who serve the city as its officers as they are in having honest and capable men in charge of the affairs of the city. The foregoing statement of the purposes and condition of the Good Government League is issued by order of the league through its Committee on Publicity. PUBLICITY COMMITTEE. Through the Rev. M. H. Alexander the Good Government League has issued a statement to the public showing that J. S. Sweet is president of the organization, Luther Burbank vice president, C. E. Wingate secretary and A. Tremblay, treasurer. The statement also contains the information that committees have been named on the following: Education, legisation, amusements, public morals, streets and parks, public utilities, sewage and sanitation, criminology, publicity, business promotion, arbitration and harmony, and of law enforcement. The membership is now said to be "considerably in excess of two hundred and rapidly growing." Most of the other information contained in the statement, which deal principally with the aims and objects of the organization, has already been published. According to the platform, "the purpose of the organization is the securing and enforcing of law and order." Our dearly beloved newspaper contemporary suffered a cat fit last night when it learned, alas, that the Good Government League was really alive, and what is worse, is composed of a great many prominent members of the political party whose battles the aforesaid contemporary fights. And so violent was the seizure that the contemporary was unable to find more than a few scant lines of space to give to the league announcement in connection with the present campaign. There are those who wonder if the contemporary was not fearful of consequences why it is that it attempts to belittle the plans of some of the most influential of its own party. In 1905, Santa Rosa had two faces - as did its main newspaper, the Press Democrat. On one side was the sleepy little farm town, where we all met downtown Saturday night to listen to the brass band tootling away on the courthouse balcony as we shopped, and what crime was reported in the newspaper was the likes of an occasional stolen bicycle or attempted burglary. Santa Rosa could've been the model for the dear little town in "The Music Man." But there was another Santa Rosa that was less sugar and a lot more spice. Downtown was more like a "mining camp" when there were horse races in town, and our small community had a red-light district large enough to service, well, a mining camp. Press Democrat editor Ernest L. Finley never mentioned that face of Santa Rosa, and didn't like it when the young lions over at the Santa Rosa Republican published an exposé of the illegal gambling scene and the city's complicity. In the weeks that followed, the saloonkeepers and others who profited from gambling attempted to intimidate or close the Republican through a subscriber and advertiser boycott. While Finley didn't openly endorse the call to shut down his rival, he used it as an opportunity to ambush the Republican by renewing a petty feud that he had started earlier in 1905. For twenty years or more, Santa Rosa's nasty gambling addiction was kept out of the papers by editors like the Press Democrat's Ernest Finley and the Republican's Alan Lemmon. Whether they personally liked gambling (or for that matter, prostitution) is unknown; perhaps they kept mum because they feared exactly the sort of backlash from gambling interests as was faced by the new editor and publisher of the Republican. Most likely, though, the editors and town elders saw wide-spread gambling and prostitution as necessary evils to draw visitors. As transcribed in the previous post, the Sacramento Bee wrote an editorial in support of the Republican noting that this was an argument also made in the state capitol: "The same sort of talk has often been heard in Sacramento - that the majority of the residents favored gambling, at least during the State Fair and at all other times when efforts were made to draw crowds to the city." And the number of visitors drawn to Santa Rosa and the amount of money gambled could be substantial. 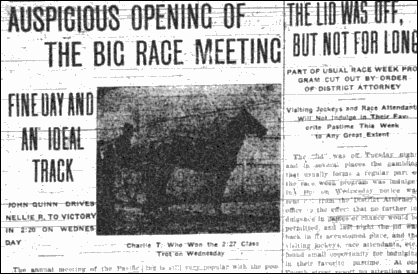 Although the PD usually described racetrack attendance in generalities like "a good sized crowd," the item below shows that even an off-season race could draw five hundred from San Francisco (that there were so many bordellos is no longer surprising) and that side bets at the racetrack could pay around double the $300 that an average American worker made at the time as an annual wage. Yes, we had Trouble right here in our River City - With a capital 'T' and that rhymes with 'P' and that stands for 'ponies' and 'prostitution.' Only we didn't have a Harold Hill to rouse the town against it until 1905. The San Francisco Driving Club held a very successful race meet at the track of the Santa Rosa Stock Farm on Sunday afternoon and some excellent racing was witnessed by a large crowd of enthusiastic spectators. The afternoon was not devoid of sensational features and fun. A special train brought five hundred visitors from San Francisco and a great many more swelled the crowd from this section. Owing to the oncoming of darkness two of the harness races were not finished and it was agreed to complete them and have another meet here next Sunday. If it wasn't for that little matter of an earthquake in 1906, the biggest news story in early 20th century Santa Rosa would've been the exposé that for at least one week every year, Santa Rosa was a "wide-open town" where police tolerated criminal activity. Even though local children were found alongside professional gamblers from San Francisco at roulette wheels and crap tables in the backrooms of downtown saloons and hotels, illegal gambling was condoned, even encouraged, by the City Council - as well as by Press Democrat editor Ernest L. Finley. Santa Rosa's biggest dirty little secret was that the August horse races brought in gamblers from outside Sonoma County, and the town welcomed them by throwing out state and city gambling laws. Local authorities kept an eye out for cheating during the illegal games, sometimes watching too closely; one deputy sheriff was found gambling himself, and a former deputy was running an illegal card game. An unnamed "prominent city official" was also among those betting and inviting his friends to "come up." This pattern of lawlessness apparently dated back to the 1880s and was ignored until the 1905 racing season, when the new editor and publisher in charge of the Santa Rosa Republican published the investigative story below. This was a kind of fresh journalism that Santa Rosa had not before seen. The Press Democrat at this time of year read more like The Racing News, reporting all track results, time of each horse, and the purse for each race, complete with racetrack lingo: "Charlie T. was out for the long green," "Miss Win felt the flag." Photographs, otherwise rarely found in the PD at this time, were plentiful when it came to horsey portraits during racing week. Press Democrat editor Finley first tried to downplay the rival paper's scoop. In a short item seen at right (transcribed below), and next to one of its typical racing blurbs, the PD reported only that "visiting jockeys, race attendants, etc., found small opportunity for indulging in their favorite pastime" because of the crackdown, still ignoring the larger problem that the paper had long ignored. When arrests were made the following day, the PD likewise made not much ado. Finley apparently didn't see that he was on the wrong side of history by sanctioning illegality. Reform was in the wind during 1905 and following years, thanks in part to both the progressive leadership of newly-elected President Teddy Roosevelt and the golden age of muckraking journalism. Change was certainly the byword in San Francisco, where a series of Grand Juries and activist groups were starting to root out the corruption of long-time city boss Abe Reuf. Just days after the Santa Rosa Republican exposed illegal gaming in the City of Roses, an August 20 Press Democrat headline reported on the newly-released findings by the San Francisco Grand Jury, "POLICE INVOLVED IN CORRUPTION AND FRAUD." But the PD's skimpy article mentioned only "charges of malfeasance and misconduct" without going into detail that the Grand Jury found specifically that elected top SF officials and police were taking kickbacks and bribes from gamblers, whorehouses, and illegal saloons. Too close to home, perhaps? To be fair, it must be noted that the Santa Rosa Republican likewise ignored local crime. As described in "Wide Open Town Part I," Santa Rosa had an enormous red-light district for the size of this town, with no fewer than eleven whorehouses just a couple of blocks away from the downtown courthouse. It was mentioned in passing once in an essay published by the Republican, but neither paper crusaded against Sonoma County's Ground Zero for prostitution. It took Editorialissimo Finley a week to plan out a campaign, and his counterstrike was both brilliant and deplorable: he completely ignored everything about the illegal gambling issue, instead slamming the Republican for supposedly being ignorant about and/or hostile to vital Sonoma County agricultural issues. Distract and demonize: Finley's 1905 Press Democrat was the Fox News of its day - petty, mean, vindictive, and wrong. Finley blasted away with charges that the Republican was trying to "force the price of hops downward" by simply printing bonafide market reports. The Republican foolishly defended itself, which gave the Press Democrat even more ammo. The Republican editor should have known better; this incident was an almost exact replay of the opening salvo of the newspaper feud of 1905, when the PD misquoted Luther Burbank, the Republican corrected the error, and the two papers ended up in a silly squabble over whether Burbank was "chagrined" or not. But this time around the dance floor, the Press Democrat brought friends with sharp elbows. "This afternoon the Republican learned that a petition was being circulated among the merchants of the community asking that those who are advertisers with the Republican agree to discontinue their patronage, because of the stand that this paper has taken in the matter of printing the facts about the gambling games," the Republican noted in the issue following their exposé. A couple of days later, they noted that Frank Brown of the Oberon Saloon was leading a boycott of the Republican, followed by a smug little editorial note in the Press Democrat: "Santa Rosa should have a big street fair or something of the kind this year. Who will take the contract to get out and raise the necessary funds?" 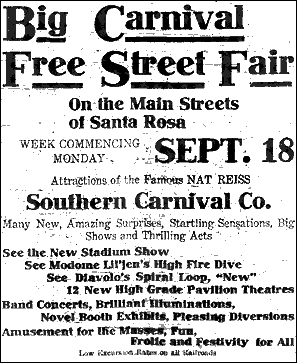 Promoting that upcoming street fair was none other than Frank Brown, who stayed true to his words and took out no advertisements in the Santa Rosa Republican. This exhibition of pique ended when the carnival arrived, and discovered that it wasn't being promoted at all in one of the town's newspapers. And with that, the battle lines were drawn. Finley began calling the rival paper the "Evening Fakir," which he would continue to use until the earthquake. The Republican took to calling the Press Democrat the "Morning Screamer." For several weeks it has been known that preparations were quietly going on for the running of gambling games during the races here this week. Gambling was done last night in at least five places in town. Today, after the Chief of Police and Sheriff had stated that they did not feel called upon to interfere, the facts in the case were presented to the District Attorney. At noon Deputy Rolfe Thompson issued an order directing the peace officers to enfoce the law. Whether the illegal gamess will close remains to be seen. The "Tiger" was loose in Santa Rosa last night. Gambling games, prohibited not only by the State law but by city ordinances, were in full blast in at least five places in the city and no effort was made by the authorities to stop them. In fact the games were even patronized by a deputy sheriff and at one of them a prominent city official was playing and inviting his friends to "come up." While the games had hardly settled down to the kind of play that is usually seen in places where the "lid" is off, it was tolerably brisk, the patronage good and the operators took in a nice pile of coin. An investigation made by the Republican during the evening disclosed scenes down town that resembled in miniature those in mining camps where gambling is the only diversion and amusement of the men. Faro, roulette, craps and klondike were the games that were being run and they were not only patronized by the visitors from San Francisco, but by many residents of Santa Rosa. There may have been games in progress elsewhere during the night, but those that were found in full blast were at the Occidental Hotel on Fourth street, at the Grand Hotel, corner of Third and Main streets, and at the Palace Saloon at the corners of Third and Main streets. At the Occidental Hotel there were four different games running. These were klondike, craps, roulette and faro. The klondike games was in the room where the bar is located. It was partly screened from view by a large curtain of calico-like stuff. The other three games were operated in the little room off the bar where cards are usually played. It was in this room that the deputy sheriff already alluded to "bucked the tiger" and ventured some of the coin he earns by preserving law and order in the Imperial County of Sonoma. He took a spin at roulette, which was presided over by a man who might have been fifty or thereabouts, but who seemed an expert at making the wheel go around. On leaving the roulette game the deputy sheriff went to the klondike game, which was presided over by a man who, unless his appointment has recently been revoked, was also a deputy sheriff for the County of Sonoma. It is understood that the deputy was out under orders from the Sheriff to see that no "crooked" work was done. While the roulette wheel had a fair share of patronage it was apparently not so attractive to the men, young and old, as were the craps and faro games. Around these tables were the sons of some of the best people in Santa Rosa--parents who, doubtless, had not the slightest suspicion that their boys were witnessing the seductive games that the law has seen fit to prohibit for the good of society. Some of the boys ventured a little bit of money and most of them lost. But of course they were being initiated in the art of "bucking the tiger" and it was to be expected that they would have to pay for their experience. Among these young men were those who hold positions of trust in business and official life here in Santa Rosa, and it is understood that one lost all the coin he had although, according to his own admissions, he had overdrawn his bank account. Across the street at the Oberon there were two games in operation with a piano player to help the sport along and make harmony with the click of the dice. Here, too, the games were hidden from public view by the use of a curtain which reached to the ceiling. Behind a klondike outfit and a crap game were in full blast. Patronage was good but, possibly, not so liberal as it was at the Occidental. Another hotel--the Grand--had a klondike table going in the card room to the rear of the bar. The patronage here was somewhat limited, although the "tiger" was doubtless as easy to buck as it was elsewhere in the city. On the opposite corner in the Palace Saloon another klondike game was going. Further down Main street at 103, in the Senate Saloon, still another klondike game was to be seen, and the operator lazily counted his coin, as he pondered how much larger a crowd he would probably have had were he located on Fourth street. All during the evening the city's police officers were in evidence, and there is reason to believe that they were just a bit disturbed at the situation. Frequent conferences were held and there was much riding up and down on wheels as if they were looking for someone, but so far as is known the games were not molested. The Republican has been informed that heretofore when there have been races at the track that the "lid" has been taken off and that gambling was winked at by the officials. Just why this was so the Republican is not informed. Other communities enforce the law and there is apparently no valid reason why the "tiger" should have swing in this city. The law on the subject is too plain to be misunderstood or overlooked. Both the State and the city have laws on the subject. For the benefit of those who may not be familiar with them the Republican prints herewith quotations from State as well as city ordinances. Chief of Police Severson was seen this morning and asked in regard to the games that were running last night. He said that he knew the games always ran during the race meets and that while they were prohibited by law he had heretofore received instructions from the Council to "keep things down" the best we could and prevent any crooked games. "I am powerless to do anything if the Council will not back me up," said Severson. "Two years ago I made an arrest and went to considerable expense but the Council would not allow the bill and I was out $58. I do not understand that things are any different now. If I hear that any more crooked games are being run the men who operate them will be pinched. Anyhow it is up to the Sheriff. I take my orders from him in the last resort and he ought to enforce the state law if it is being broken and the people do not like it. My policy will be to do the best I can under the circumstances unless I receive instructions to close up the games." Sheriff Grace was also seen. He made the same statement that Severson had made - that it had been the custom to hold things down so that while the games were allowed to operate nothing but games he called "square" would be countenanced. The Sheriff thought that he was doing his duty under the circumstances, for it was only following custom which permitted more latitude in town during the week that the races were here. Said he when it was suggested that the state law was specific upon the subject: "I don't propose to stand for any crooked games. In order to do this I had Gist out last night with three others to wath the games and see that they were being run on the "square." If they are to be closed down it is up to the District Attorney. He is the man to act. You know I am not a candidate for re-election, and I think the orders should come from the office up stairs." District Attorney Pond is out of town enjoying his vacation, but in his absence Deputy Rolfe Thompson is in charge of the office. When the matter was broached to Mr. Thompson he said at once that if there were violations of the law the District Attorney's office would do all in its power to stop them. Accordingly he looked up the law, and after an investigation into the facts decided that his office would at once make a move to shut up the game. His plan was to instruct the peace officers of the county to do their duty and close the games. In protesting against the continuance of gambling in Santa Rosa the Republican wishes it to be distinctly understood that the policy of this paper is for all legitimate sporting enterprise. The raising and breeding of fine horses is not only one of the most important industries in the county, but is one of the most important in the state as well. And speed contests between high-bred animals on a fine track are things that make the blood tingle in the veins of every true American. And the industry ought to be encouraged in every possible manner. But it is assumed that it is no more necessary for the present races at the Santa Rosa track to be accompanied by the legally prohibited gambling games that it is in other places where the law is obeyed and enforced. The papers are full of instances where gambling has worked ruin to many bright, promising men and boys, and so thoughtul of society is the law that it has put strict prohibitions on the statute books. About noon Deputy District Attorney Thompson announced that he had been in communication with Mr. Pond over the telephone at Healdsburg and that the latter had said to go ahead and do what the situation demanded. "Mr. Pond also told me to notify the peace officers to enforce the law and to say that if they did not comply that actions would be brought against them for not performing their sworn duties," said Mr. Thompson. "Acting upon these instructions I at once told Chief of Police Severson to close up all games he found operating. Mr. Severson said he would do so and I understand that he so informed his men. I made an effort to get at the Sheriff but he was closeted at the time. However, I shall see him later and say to him what I told the Chief of Police." The Deputy District Attorney also caused to be published the notice which appears in larger type on this page [DEPUTY ROLFE THOMPSON ORDERS LAW ENFORCED...]. He said that he hoped he would not be compelled to take any further steps, but that evidence had been and was being gathered and that if the games continued to run that prosecutions would result. P. H. QUINN MAKES STATEMENT. P.H. Quinn of the Occidental Hotel was interviewed in connection with the games. He declared in the most emphatic trms that he had nothing personally to do with the operations of the games. Mr. Quinn said: "I do not believe in gambling. I think the games do no good, and the only reason that we tolerated them in the house because it was represented to us that somebody in authority had given permission for the games to be run during this week. At any other time we do not permit anything of the kind on the premises. We permitted certain parties to use the hotel only this week and if the authorities want the games closed they will have our co-operation. It seems that those who subscribed the money to bring the races here felt that in the operation of the games that they would find a way to get their money back." Walter Farley, Lous Guesa and Deputy Sheriff Bob Garner were arrested this morning on complaints sworn to charging them with gambling, running a percentage and banking game known as klondike. Despite the warnings given the men yesterday by Chief of Police Severson these men saw fit to violate the law and conducted a gambling game last night at the Oberon Saloon. Each of the men was found conducting a game, and warrants were sworn to this morning on which they were arrested. They were notified to be at Justice Atchinson's court room this afternoon at 2 o'clock. There was no attempt to disguise the fact that gambling was being carried on in the saloon last evening. Dozens of persons were about the gaming tables. The crowd surrounding the table included sons of some prominent families of the City of Roses, who were being given a rudimentary education in the seductive pastime of gambling. Under orders from Chief of Police Severson his officers went into all the saloons last evening and inspected them for games. So far as is known the Oberon was the only place which did not comply with the order of the District Attorney. The Occidental Hotel, true to the statement made by P.H. Quinn, closed up the games. This afternoon the three men against whom complaints were issued appeared before Justice A. J. Atchinson through their attorney, Joseph P. Berry. They took advantage of the statutes, which provides that they may have two days in which to be arraigned and enter their pleas. District Attorney Thompson has announced that these men will be arrested again if caught conducting games tonight or at any other time, and that any others caught gambling will also be dealt with according to the law. This afternoon the Republican learned that a petition was being circulated among the merchants of the community asking that those who are advertisers with the Republican agree to discontinue their patronage, because of the stand that this paper has taken in the matter of printing the facts about the gambling games. The gamblers, the backers of the illegal games and some others who feel their business and political interests are involved with the men who own the "layouts" are exceedingly wroth with the Republican because it has had the unparalleled audacity to publish the facts, to point out the very stringent provisions of the law against gaming and in doing so, to disturb the "custom" of twenty or more years' standing and place the responsibility where it belongs. In their heat at the stand this paper has taken, those who feel injured have proclaimed that the Republican is opposed to saloons, that they have more money than the publishers of the Republican, that they will "put the paper out of business" and that all kinds of "discipline" will be administered in copious doses. In discussing the statements thus made to obscure the real issue, the Republican wishes to say that it does not for one instant believe that the community sentiment of Santa Rosa is for gambling - open or secret - nor that its residents acquiesce in the "custom" prevailing in previous years. It believes that had the matter been brought to an issue at any time in the past, public sentiment would have been unmistakable. It is so now. The great majority of people in this city are glad that the "custom" of "taking off the lid" during racing meets or other gatherings has been fractured and that in future illegal gaming will not be "winked at." The Republican has no quarrel with saloon men as a class. Under the law, a man has as much right to deal in wet goods as in dry goods. But because the law gives a man license to conduct a saloon and protects him in that right is all the more reason why he should endeavor to abide by the law, which forbids in the strongest terms the countenancing of gambling, even though it has been the "custom" for time out of mind. As to the other remarks or threats, The Republican will blushingly admit that the parties who feel they have a right to be aggrieved possess "more money" than its publishers. It congratulates them on their opulence, merely suggesting that with so much of the world's goods it woould seem unnecessary that their store of gold should be added to by the adoption of questionable methods. As to the threat made to "put the paper out of business," The Republican inclines to the belief that the persons responsible for the statement will think better of it. The "lid" was off Tuesday night and in several places the gambling that usually forms a regular part of the race week program was indulged in. But on Wednesday notice was sent out from the District Attorney's office to the effect that no further indulgence in games of chance would be permitted, and last night the lid was back in its accustomed place, and the visiting jockeys, race attendants, etc., found small opportunity for indulging in their favorite pastime. At one Fourth street resort no attention was paid to the notification, and late last night a Press Democrat representative was informed by authorities that a charge would be filed against its proprietors this morning for failing to comply with the law against conducting games of chance. They boycott against the Republican instituted by Mr. Frank Brown and his friends because this paper printed the facts about the existence of gambling games here apparently does not make the headway immediately that Mr. Brown hoped it would. ...What the banker and the merchant and the real estate man all seek is new families who will make their homes in the community and spend their earnings among the store-keepers, put savings in the banks, and buy property to improve. Touts, gamblers and sure-thing men do not do this. In fact they are a menace to the large property owner, who, least of all, wants anything to happen that will depreciate values... it is just as much to the interests of the ordinary saloonkeeper to keep out gamblers as it is to the interests of the grocer, the hardware man, or the butcher. Because the Santa Rosa Republican has had the courage to take a firm stand against gambling in that town, and to publish the facts regarding violations of the laws against gambling, a number of saloon men and other persons have undertaken to boycott the paper by withdrawing their advertisements. The Republican is by no means cowed by this contemptible effort to prevent it from doing its duty, but, on the contrary, is making a plucky fight, not only against the gamblers but also against those who are aiding and abetting them in their impudent defiance of the law. The same sort of talk has often been heard in Sacramento - that the majority of the residents favored gambling, at least during the State Fair and at all other times when efforts were made to draw crowds to the city. But the truth is that by far the great majority of the residents of Sacramento, and doubtless of Santa Rosa also, are strongly opposed to gambling, and rightly believe it to be one of the worst of evils. No community can afford to stand for open disregard and defiance of laws against gambling. The Republican should profit by this nasty boycott. If Santa Rosa deserves a fearless and honest newspaper, the great majority of her business men and other residents will stand by this exponent of law and order, and show by liberal use of its advertising columns that they are in sympathy with the firm stand it has taken for the right. IS IT IGNORANCE, OR WHAT? The determined efforts that have apparently been put forth by the Evening Republican during the past few months to force the price of hops downward has occasioned considerable comment among hop growers, who have heretofore been in the habit of seeing the local papers stand up and endeavor to protect the county's crop interests instead of injuring them. Whether the Republican's course has been prompted by any motive which do not appear upon the surface, or whether it has simply been the result of ignorance, as was the case in its recent attempt to introduce the codlin moth here "for the benefit of the fruit growers," we are unable to say. The fact remains, however, that in constantly circulating erroneous reports regarding short crops and low prices in other places its publishers have been injuring rather than benefiting one of the principal interests of the county. And the public generally is fully appreciative of the fact. When the astute gentlemen now presiding over the destinies of our esteemed contemporary have been longer in authority, they may be both wiser and more appreciative of the responsibility that attaches to such positions. In the meanwhile they will find out, if they do not know it already, that interested parties are always ready to supply all the "bear hop copy," that anybody will print gratuiously; also that some of these people are occasionally willing to pay liberally for having such matter printed., if necessary; and also, again, that we farmers are not always as great fools as we may look. Santa Rosa should have a big street fair or something of the kind this year. Who will take the contract to get out and raise the necessary funds? IS THE PEE-DEE FOR A WIDE-OPEN TOWN, OR WHAT? It is really amusing to note the twistings and turnings of the Pee-Dee, the gamblers' friend and apologist, in its efforts to avoid discussing the question of illegal gambling in Santa Rosa. Those who have watched the progress of matters, have not, however, been surprised at its attempts to belittle the movement for a clean town and to minimize the flagrant infraction of the laws. The reply of the gamblers' friend this morning to The Republican's editorial of yesterday leaves no matter just where it was. The Pee-Dee makes much of the hop question, which it precipitated in order to get away from the gambling matter. But the people of Santa Rosa, who are interested a great deal more in having gambling suppressed than in newspaper bickerings, would be both pleased and astonished to hear from the Pee-Dee on whether it believes in a wide-open town or in one known to be opposed to law-breaking...the Pee-Dee's dead silence is that it is either a believer in a wide-open town, regardless of the laws and the welfare of the community, or that it dares not criticize those who are responsible for the breaking of those laws. The feeble efforts of the Pee-Dee. the gambler's friend, to make it appear that the Republican's hop reports are published in the interests of the "bears," have greated much wonderment, for when it is all simmered down the Pee-Dee really has said nothing but what has been completely disproved by the actual market conditions....Sputtering and fuming and misrepresentations on the part of the Pee-Dee, which is anxious not to admit that the real issue before the people is one of whether or not Santa Rosa shall be an open town, will not help the gamblers any, nor the Pee-Dee either, for that matter. The Republican of Friday evening devotes two full columns to an attempt to answer the Press Democrat's charges regarding the manner in which it has been handling hop reports lately, but its efforts remind one of a fourth-rate juggler trying to keep three balls in the air at the same time. Between its very evident desire to keep itself and its affairs before the public, its attempt to create political capitalout of a matter that has no connection with the case whatever and its effort to divert attention as far as possible from the freal issue, the exhibition is anything but a success. As a matter of fact, the Republican for some time has been publishing hop news furnished by dealers whose interests lie in seeing this year's crop sell for a low price...in view of the amusing spectacle the paper has made of itself in other ways since coming under its present management and trying to pose as the only real friend of the farming element that ever happened, the former is perhaps the case. Only a few months ago the Republican published a most entertaining article telling how it had been planned to introduce codlin moths into Sonoma county "for the benefit of the fruit growers," and other breaks almost as bad have been of frequent occurrence since. THE PEE-DEE MUST HAVE BEEN "DOZING"
It is not often that the Republican has occasion to parade its business before the public. But once in a while there arises a case where it seems necessary. Such a occasion has come now in connection with the visit to Santa Rosa last week of the Southern Carnival Company. It will be remembered that some time before the company came to town Mr. Frank Brown of the Oberon Saloon appeared before the Council in the guise of a friend only who had no personal interest in the shows, secured from the Council permission for the carnival to use some of the main business streets of the city for the payment of a $50 license for the entire week. Subsequently it transpired that the carnival company and Mr. Brown had a deal under which Mr. Brown was to handle the advertising of the carnival and also share in some manner in the profits of the affair while it was here. At least this is the story told by two of Mr. Reiss' representatives. So far so good. Mr. Brown harbors a grudge against the Republican and, accordingly, when it came around to the matter of placing newspaper advertising, did not put any in the Republican thinking that he was having a splendid time playing even for the expose made by this paper of the gambling games he operated during race week. Things ran along till the Monday of the week that the carnival was to open. Mr. Reis arrived here from Woodland and discovered that he had had no advertising in the Republican. He naturally made a few inquiries and learned that in order to vent a petty spite of his own Mr. Brown had deprived the carnival company of considerably [sic] publicity it stood in need of in order to reach the many residents of Sonoma County who do not take Mr. Brown's favorite sheet, the Morning Screamer. It was then that Mr. Reis made his way to the Republican office and asked what arrangements he could make to advertise the carnival for the remainder of the week. He was informed of the rates and closed a contract for a certain number of lines of reading notices at so much a line. It may be interesting for the Morning Screamer to know that Mr. Reis declared he would attend to his own advertising next time, for he admitted that the attendance had been materially lessened by Mr. Brown's trick. And should Mr. Brown wish to see a duplicate of the contract made by Mr. Reis that document may be inspected at the Republican office. If this situation affords the Screamer any comfort in its silly campaign against the members of the Good Government League the Republican is satisfied. Several times in 1905 the Press Democrat teased that an upcoming edition would feature a special section on the "Homes of Santa Rosa" to showcase the town - but as far as can be determined, the insert was never produced; the article below was the last mention of it that can be found in the paper. A great loss; pictures are few of Santa Rosa's Victorian-era splendor, now almost all gone. It's quite likely that this photograph of Comstock House was taken for the abandoned feature. As explained in the caption, it is the oldest known picture of the home, predating the 1908 or 1909 postcard. There's also a "halo" around the house burned into the photo, and the Press Democrat followed the popular newspaper layout style of the day of showcasing related images as a collage of oval or circular portraits - see page 23 of the PD's Sonoma County promotional insert published later that year for an example. Another nugget of evidence is the quote from our own James W. Oates, specifically demanding a "good, clear picture" of his new, fancy digs; editor Ernest L. Finley probably wouldn't have included such a specific quote unless a photograph was already taken or planned. Aside from Oates' narcissistic gratification, however, others spoke of "Homes of Santa Rosa" as a needed tool for promoting the region to outsiders. This article came at the end of summer and as Finley admitted that Sonoma County had completely squandered the opportunity to promote the area at the Lewis and Clark Exposition in Portland that summer, which had turned out to be a boon to other communities in California, particular in the southern part of the state. A lack of cooperation between powers-that-be within the county was apparently the reason why we were a no-show at the Exposition, and not transcribed here are still more quotes from eight other businessmen praising the idea of a "Homes of Santa Rosa" brochure, with several chiding local factions for not compromising for the common good. "If we of Santa Rosa ever expect to gain anything or anybody of importance it must be by united effort. Selfishness is mighty poor capital," merchant J. H. Einhorn told the PD. But the main purpose of this lengthy, two-column article may have been to shore up the Press Democrat's standing in the community. A month earlier, the new editors at the rival Santa Rosa Republican had exposed widespread illegal gambling which town officials and the PD had ignored for a decade or more. And just days before this promise of a deluxe spread on the "Homes of Santa Rosa" appeared, it was announced that movers-and-shakers reformers in town had formed a "Good Government League" to support a crackdown on the gaming. Finley must have known at this point that his paper was on the wrong side of the war, and risked losing its status as a respectable journal. In its forthcoming special edition the Press Democrat will spare no effort to properly set forth the advantages of Sonoma county as a place of residence, and its "Homes of Santa Rosa" will be made a strong feature. This section of the edition will be printed on the finest quality of half-tone paper, and the engravings will be of the very best, the idea being to show homeseekers how comfortable and home-like the majority of Santa Rosa homes really are. Ex-Mayor J. S. Sweet said yesterday: "If the thing is done right, it will result in untold good, by inducing the most desirable class of familes to locate here. Southern [California] real estate men understand this, and act accordingly. They also pull together, while here the reverse is too often true. Seventy-five percent of my advertising is done by pictures, and it pays." Attorney James W. Oates said: "I can best tell you how I feel about it by telling you to send your photographer to my home. Count me in, but be sure and give me a good, clear picture." Frank A. Brush, cashier of the National Bank, said "There is no question but that this method is the best. Nearly every visitor in this locality is in very moderate circumstances. We have a great town. Deposits at all local banks have been increasing constantly rapidly. Practically no money has been spent along this line before, but it is not too late. Am sorry to say we have been a slow set of people. Santa Rosa should today be a town of 20,000. We have always been willing to take what good things were forced upon us, but we don't like to get out in the middle of the road and help push. There have been ten fine homes built right in San Jose during the past twelve months to our one here, still we have advantages that the former town dare not claim."